Supported by the overall steady operation of China’s macroscopic economy and textile industry, the industrial upgrade of the textile machinery was more deeply promoted to achieve a favorable overall quality and efficiency and to maintain a consistent growth momentum. The main business income and the export market kept on a two-digit growth, but the operation growth speed over the past three quarters showed a trend of slowdown. In the first three quarters of 2018, the textile machinery industry generated an operating income of around 77.634 billion yuan, registering a year-on-year increase of 12.1%, and the growth speed fell by 0.82% compared with that in the same year last year, and slowed down by 3.91% compared with that in the first half of this year. In the first three quarters of 2018, the textile spinning industry realized a total profit of 5.335 billion yuan, registering a year-on-year increase of around 9.44%, and the growth speed slowed down by 10.12% compared with that of the first half of this year. The total losses of enterprises in the industry reached 263.8 million yuan, registering a year-on-year reduction of 17.70%, and the scale of losses was 15.11%. The profit margin of the operating income of the textile industry was 8.20%, which was 1.05% higher than that of the same period last year. According to customs statistics, the import and export of China’s textile machines in the first three quarters of 2018 totaled at 5.531 billion USD, registering a year-on-year rise of 12.70%, in which the textile textile machinery contributed an export of 2.780 billion USD, increasing by 16.96% compared with the year before, and an import of 2.751 billion USD, increasing by 8.70% over the year before. The export growth rate far exceeded that of the import growth. From February on, the trade of the textile textile machinery industry had changed to a surplus. Germany, Japan, Italy, Taiwan (China) and Belgium were the countries and regions ranking on the top 5 in the import list over the first three quarters of 2018. Among them, the import of Germany grew significantly by 27.06%; the import of Japan grew by 3.72%; the import of the rest all suffered different degrees of slide. Among major product categories for import, the import amount of chemical fiber machinery, weaving machinery, non-weaving cloth machinery, auxiliary device, spare and accessory parts all maintained consistent growth. On the contrary, the spinning machinery, weaving machinery, and dyeing, printing and finishing machinery experienced a year-on-year decline. Meanwhile, the largest growth was found with the chemical fiber machinery. China mainly imported textile spinning machines from Germany, Japan and Italy: 222 million USD (47%) for Germany, 97 million USD (21%) for Japan, and 94 million USD (20%) for Italy. Japan, Belgium, and Germany ranked as the top 3 largest weaving machinery exporters to China: 157 million USD (46%) for Japan, 96 million USD (28%) for Belgium, and 35 million USD (10%) for Germany. Japan, Germany, and Italy were the top 3 exporters of knitting machines to China: 105 million USD (43%) for Japan, 85 million USD (35%) for Germany, and 42 million USD (17%) for Italy. In the first three quarters, China mainly imported chemical fiber machines from Japan and Germany, of which 295 million USD or 56% was from Japan and 214 million USD or 40% was from Germany. As to China’s import of non-weaving machines, Germany and France accounted for 59% (42 million USD) and 16% (11 million USD). China mainly imported printing, dyeing and finishing machines from Taiwan (China), Italy, and Germany, which accounted for 31% (84 million USD), 24% (67 million USD) and 20% (53 million USD), respectively. In the first three quarters of 2018, 29 provinces, cities and autonomous regions in China imported different amounts of the aforesaid machines. Jiangsu, Zhejiang, Guangdong, Shanghai, and Xinjiang were the top 5 importers in China. Excluding the declining import amount of Guangdong, all the rest was rising, of which the rise was particularly impressive in Zhejiang and Xinjiang. Among the export destinations, India, Vietnam, Bangladesh, Indonesia, and Turkey ranked on the top five. Excluding India, all the rest had realized growth, of which the growth of Turkey as high as 52.93%, Vietnam as high as 52.94%, and Bangladesh as high as 15.17%. In the first three quarters of 2018, Jiangsu, Zhejiang, Shanghai, Guangdong, and Shandong ranked on the top five exporters of textile spinning machines, of which Shandong and Jiangsu experienced the most significant growth. Countries and regions along the “Belt & Road” constituted the major export destinations of China’s textile machinery. The export volume of the first three quarters from China to countries and regions along the “Belt & Road” took up around 72.56% of the total, and reached 2.017 billion USD, registering a year-on-year increase of 18.35%. Among the primary export markets, the growth rate of the ASEAN, Central Asia and West Asia was the highest. With the acceleration of the industrial transfer of the textile industry, demands of countries and regions along the “Belt and Road” would be further strengthened. Currently, a majority of enterprises have reported a series of problems arising from their production process, and the main problems include serious fluctuation of raw material prices. The foul play not adhering to the market order or excessively reducing the price to win an edge, and difficulty in employing the right and adequate. Meanwhile, the weak domestic demand, lack of protection for intellectual property rights, rising cost induced by inflation, trade frictions, pressure of energy conservation and emission reduction, and financing difficulty―all these are common problems facing enterprise’s development. In the first three quarters of 2018, more than half of enterprises had their orders increased by different degrees. There were 37.40% of enterprises increasing their total orders by more than 10%, 25.75% of enterprises increasing their total orders within 10%; and 26.02% achieving the quantity of orders almost the same to that of last year; 10.84% experienced a decrease in orders. 26.33% of enterprises increased their overseas orders by more than 10%; 24.26% of enterprises experienced an increase of within 10%; 37.87% of enterprises had maintained the growth the same to the last year; and 7.99% and 3.53% of enterprises reduced their overseas orders by within 10% and more than 10%, respectively. Compared with the same period last year, in the first three quarters of 2018, 17.86% of enterprises increased the selling price of their major products by more than 5%; 22.25% of enterprises increased it within 5%; 41.48% of enterprises maintained the price almost the same to that of last year. However, around 35% of knitting enterprises pointed out that their ex-factory price was downregulated. 80.94% of enterprises had their inventory increased or maintained the same in the first three quarters of 2018. Among them, 31% of printing, dyeing, and finishing enterprises increased their inventory considerably. On the whole, 10.50% of enterprises increased their inventory by more than 10%; 15.57% of enterprises increased it by 15.57%; 54.70% of enterprises maintained their inventory almost at a level the same to that of the last year; 14.95% of enterprises reduced their inventory by within 10%; 4.14% cut their inventory by more than 4.14%. Since Q3 of 2018, some products were overstocked because of downstream enterprises’ delay in picking up the delivery. In the first three quarters of 2018, enterprises whose equipment utilization rate was above 80% accounted for 60.11%; the equipment utilization rate of 33.62% of enterprises ranged from 50% to 80%. 5.98% of equipment was utilized at a rate lower than 50%. On the whole, the equipment utilization rate of medium-and large-scale enterprises was lower than that of small-and micro-scale enterprises. On the whole, the equipment utilization rate dropped compared with that in the first half of 2018. In 2018, 19.65% of textile spinning enterprises newly increased their domestic investment; 4.62% of enterprises newly increased their overseas investment. In 2019, 8.01% of enterprises have the plan of increasing their domestic investment; 24.93% of enterprises have the plan of increasing their overseas investment. Comparatively, enterprises showed a stronger willingness in increasing their overseas investments. 2017 witnessed a comparatively huge growth of sales of major textile machine products in China and the world. According to the global statistics of the textile machine delivery amount issued by the International Textile Manufacturers’ Federation (ITMF), the delivery of cotton spinning machines, rotor spinning machines, elasticizers, shutterless looms, and computerized flat-knitting machines increased by 21%, 24%, 23%, 13% and 44%, respectively. The delivery of circular machines was almost the same to that of last year. The airflow machines, overflow dyeing machines, mercerizing wires and gassed yarns in printing and dyeing equipment experienced a significant growth. Throughout 2018, the market performance of different textile machinery sectors varied. A large number of spinning machine product slowed down their sales. Since Q3 of 2018, the market growth slowed down, and the sales of major knitting machinery products was on a downward trend. Printing, dyeing and finishing machines kept on prospering. Sales of chemical fiber machines in the first three quarters soared up, but the growth of newly-increased orders in Q4 dropped. Non-woven fabric machines, after experiencing years of high growth, was on a downward trend last year. Despite of segmentation of different markets, the concentration degree of different industries increased, and the market share of competitive enterprises would further increase. Considering the operation data, the textile machinery industry realized a steady growth in the first three quarters of 2018. However, the growth rate still slowed down. It was expected that the textile machinery industry in 2018 would achieve certain degree of growth. In 2019, though major economic organizations in the world has downregulated the economic growth rate, the world economy is still in a trajectory of recovery. The international market fundamentals were basically steady. The downhill pressure of China’s national economy will consistently grow, which will, however, not change the overall tendency of steady development. Taken as a whole, the domestic and overseas market environment facing China’s textile industry will still be stable, but the overseas demand will be confronted with more uncertainties and risks. In 2019, the business environment for Chinese textile machinery enterprises will hopefully make a turnaround. President Xi confirmed the important role of private enterprises on the seminar of privately-employed enterprises, and clarified policy measures to be taken in six aspects. Recently, relevant national departments have also intensively promulgated a series of policies to support the development of privately-employed enterprises, hoping that the common problems facing textile enterprises’ business will be further alleviated. The domestic market pressure for the textile machinery industry will be aggravated, but the main line of upgrading and transforming the textile industry revolving around cost reduction, efficiency increase, energy conservation, and environmental protection will not be changed. Intelligent manufacturing will get further applied to China’s textile industry. The automatic and intelligent equipment developed based on cross-field technologies, including the IoT, big data and cloud, will further expand the market space. 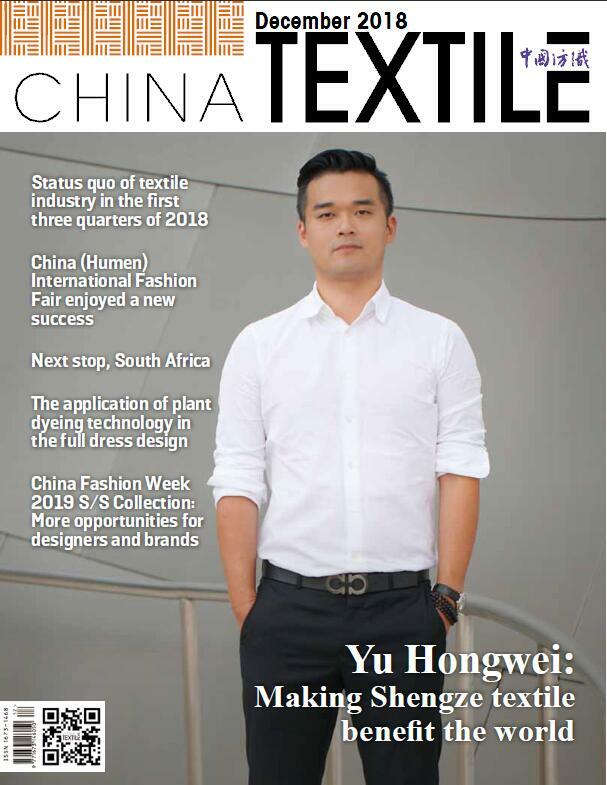 As textile and apparel enterprises quicken their global business transfer, the textile and apparel industry in North Asia, Northeast Asia, Central Asia and Africa will speed their development as well. The overseas market of textile machinery still holds the prospect of maintaining a robust growth. Challenged by an overall growth slowdown, textile machine enterprises will actively accelerate their structural adjustment, technological innovation and stabilization of operation to cope with market fluctuations and to jointly promote high-quality development of China’s textile machinery industry.